Studio Artist provides extensive support for all of the features of Wacom pens and tablets. All Wacom pen tablets provide pen pressure modulation. As you press the pen into the tablet you can modulate paint parameters based on how hard you are pressing in while drawing. There is also a pen eraser tip that can be used to switch on the fly to a second eraser paint preset when painting. The Intuos series of Wacom tablets also provide additional pen tilt and tilt orientation modulation. This gives you 2 additional degrees of interactive modulation based on how you hold and orient the pen while drawing. Additional devices are available for Intuos tablets that provide even more interactive modulation. The Airbrush pen with it’s integral thumb wheel modulator provides an additional degree of modulation on Intuos tablets. The ArtPen can also be used with Intuos tablets to provide an additional pen barrel axis rotation modulator. The 4D mouse can be used with Intuos tablets to provide a thumb wheel and mouse rotation modulators. All of the different pen interactive modulation options are accessible in the Studio Artist as modulation options throughout the paint synthesizer. For example, the screen snapshot below shows the Brush Size Modulation set to the pen pressure modulation option. 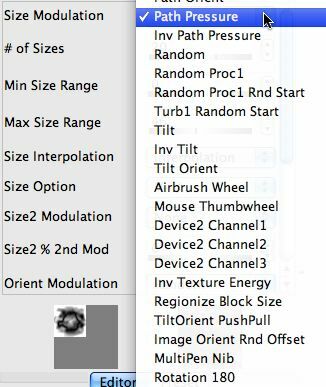 The screen snap below shows a subsection of the many different modulation options available for the brush size modulation. Tilt corresponds to the Intuos pen tilt. Tilt Orient corresponds to the Intuos pen tilt orientation. Airbrush Wheel corresponds to the airbrush thumbwheel controller. Mouse Thumbwheel corresponds to a Wacom mouse thumb wheel controller. Rotation 180 degrees corresponds to the ArtPen axis barrel rotation. Device2, Channels 1,2,3 modulation options corresponds to the use of a second wacom device on an Intuos tablet. So you could be drawing with one hand and modulating paint parameters with a second Wacom device on the tablet. An example of a second controller could be the Intuos 4D mouse or a second pen. The example discussed above are options available for the brush size modulation parameter. But there are a large number of different editable modulation parameters available throughout the paint synthesizer (over 450), and many of them contain interactive pen modulation options similar to those described above. Some factory presets may be configured to have many different editable parameters modulating at the same time based on pen pressure, tilt, tilt orientation, etc. This extreme editing flexibility enables you to create very responsive paint tools that simulate the kind of dynamic variation you see when painting or drawing with real world media. Most Wacom pens have an eraser tip. When drawing with the eraser tip in Studio Artist, the current preset will dynamically change to the current eraser preset. This happens when you start drawing with the eraser tip. When you finish drawing with the eraser tip the paint synthesizer reverts to the original current preset you were using before you used the eraser tip. The current eraser preset is stored in the paint synthesizer eraser memory. 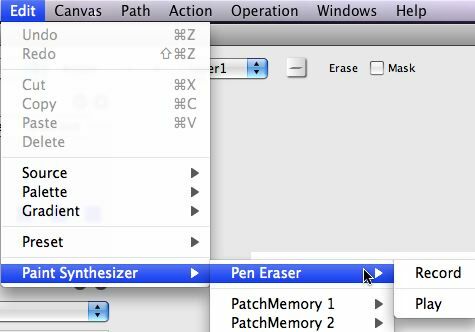 You can access the eraser menu using the ‘Edit : Paint Synthesizer : Pen Eraser’ menus. Running the pen eraser Record menu will record the current paint synthesizer settings as the eraser preset. Running the pen eraser Play menu will load the current eraser preset as the current paint synthesizer preset. As mentioned above, when you draw with the eraser tip of the pen the eraser preset is dynamically loaded on the fly into the paint synthesizer. Typically you will load the eraser preset of your choice into the pen eraser memory. But you can load any paint preset you want to, it doesn’t have to be an eraser preset. You can also use the e hotkey to activate the eraser preset when drawing (as opposed to using a pen eraser tip). This is especially useful when drawing with a mouse. If you use the b hotkey to dynamically resize the brush with the eraser tip of the pen, then you will be resizing the current eraser preset stored in the pen eraser memory. Using the regular drawing tip of the pen with the b hotkey will resize the current paint synthesizer preset in the normal way. The Wacom tablet has the ability to sense the presence of the pen as it hovers above the tablet surface before you touch the tip to the surface. This is called pen proximity. Obviously pen pressure modulation does not work when the pen is in proximity but not touching the tablet surface. However, the other interactive modulators like pen tilt, tilt orientation, rotation, air brush wheel etc all do work while the pen is hovering in proximity. This means you can use these interactive modulators while the paint synthesizer is auto drawing from an action command. Pen proximity can also be used as a modulator for some paint synthesizer editable parameters. For example, the Pen Track parameter in the Time Particles 1 control panel works off of pen proximity. Turning this parameter on give you the ability to control an attractive or repulsive force that is applied to the set of active time particles while the paint synthesizer is action drawing. There are also path start generator options that will track the current pen position while the pen is hovering above the tablet in proximity. The use of pen proximity modulation gives you the ability to interactively control action painting for artistic effect, to create live animations that could be spooled into an open movie stream, or for live visual performance. 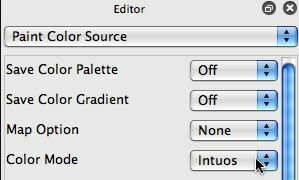 Previous versions of Studio Artist included a Wacom source color mode in the Source Area. When using this source color mode, you could dynamically control the paint color using the wacom pen as you were painting. Version 4 does not have this option available in the Source Area. However, you can access the functionality in the Paint Source Color via specific Intuos modulators for the Color Mode parameter. MSG (modular synthesized graphics) is Studio Artist modular image processing architecture. Dynamic temporal generators can be attached to specific MSG editable parameters to provide for dynamic modulation of the associated parameter. MSG temporal generators support all of the Wacom pen interactive modulators. For example, the screen snap below shows that the AdvTurb processor’s Anistropy parameter has a pen pressure temporal generator modulating it. Since MSG presets can be loaded into the paint synthesizer in many different ways, you can expand the use of interactive pen modulation into your custom paint presets by taking advantage of MSG’s temporal generator interactive pen modulation options. You could use MSG presets in Dual Mode painting to dynamically control the dual mode MSG image processing via pen modulation. Or you could interactively modulate MSG while it is processing live video or during live visual performance based on MSG presets.